In a bizarre and instinctual survival tactic, alligators that normally lurk in a swamp in eastern North Carolina are now "frozen" beneath the murky water. Every inch of the reptiles’ bodies stay underwater — except for their snout. 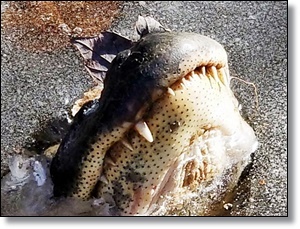 Officials at The Swamp Park in Ocean Isle Beach took to Facebook this week with a video that shows the gators icebound in the swamp with only their snouts protruding and a toothy grin sealed in place. The gators use the tactic to survive when the water around them reaches freezing temperatures in the frigid winter months.